Pat began her love of glass with her mother's Depression glass which she constantly admired. She loves the beauty of glass and how it can be used in many applications as well as how it plays with light. Fused glass is a process that produces everything from candle holders, vases, decorative platters, bowls, and plates as well as art sculptures and paintings to name just a few. If you can imagine it, a glass artist can probably produce it or at least attempt to. 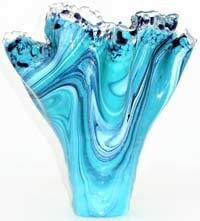 In kilnforming glass, two pieces or more of glass are chosen, cut, and assembled, then fired in a kiln. Some are manipulated while in the kiln. Next, coldworking is done if necessary. Finally, it is then slumped into or draped over a mold to give it its final shape. Oftentimes, she fires some of her glass up to five or six times to achieve a certain look. This is a simple explanation of a complicated process. It all depends on the desired final product. There is a lot of science involved. Some pieces are straightforward to do while others take time, multiple firings, and cold working. There are a variety of techniques, such as pot melts, inclusions, textured, kiln-carved, strip-cut, mesh melts, pattern bars, and powder paintings to name a few. We've added a laser etching component to glass, wood, and concrete starting with concrete coasters. Pat can create custom orders, such as vases, bowls, or dishes in different shades of color, different sizes, and different shapes. I can also do a complete matching set of dinnerware for you. This could include dinner and salad plates or bowls, serving pieces, dessert dishes, etc. It all depends on what is available.